Absolutely the best option in this area. Clean rooms. Friendly staff. Great hotel! Clean rooms, comfortable beds. Staff is very helpful and friendly. Did not clean room in a timely fashion. Had to call at least 2 days for them to put sheets on the bed. Wasn't abe to rest up. Snare in the bed spread which should have been thrown out. It was clean and efficient for the one night we stayed on our way to our final destination. We weren't looking for a grand place, just comfortable, quiet and at a good price. It was all of that. The seller for me was how beyond reasonable the pet fee was. Other places want an arm and a leg. The staff was super friendly as well. The room was clean and comfy! So you're kicking around the idea of a holiday to Brantley? If you want a place to call home that's located close to Brantley attractions, use Orbitz to pick your travel dates, and then presto! Look through the list of hotels and other accommodations to find those that are close to everything you want to see and do. There are 11 accommodations to pick from within the larger area if you can't find the ideal place to stay in Brantley. Search by filters such as price, neighborhood, guest rating, or popular locations, depending on what's most important to you. 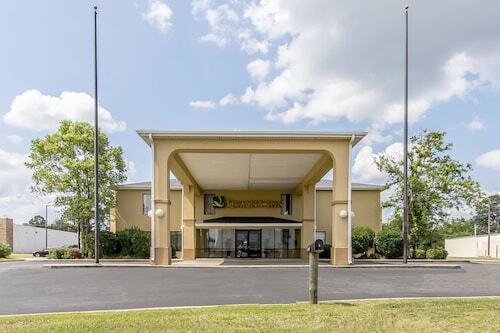 There may be a limited number of hotels and accommodations to choose from in Brantley, but here some other options located nearby so you have some choices. What's the Weather Like in Brantley? A/C unit was very noisy and had a burning smell so we had to turn it off, the toilet was not level and the seat was falling off, electric outlet in bathroom was burnt and did not work, bathtub area was dirty and wallpaper falling off and ceiling unpainted, outside door did not seal, continental breakfast was poor. Ok for a quick overnight stop. Staff very friendly and helpful. All was good for our stay at the hotel. Staff was friendly and helpful.